A personal narrative essay is a story about oneself. There is usually a point to the story—a theme that is generated over the course of the action, or an idea that is reached at the conclusion that provides enlightenment. The narrative can be humorous, joyous, dramatic, gentle, straight-forward or even surprising. Thankful why?—well, that is up to you. If your story is happy, great! If you story is sad, fine! There really are no rules. Indeed, it is all about how one chooses to tell one’s own story. Since it is your story, there’s no right or wrong way to do it. However, there is a basic structure that you can follow to ensure your personal narrative essay stays on the right track. In this article, we’ll examine this type of essay from a number of perspectives: we’ll provide you with an outline, an example, some topic ideas, and hints on how to get started. A personal narrative essay is one of the few types of essays in which the 1st person point-of-view is the accepted point-of-view. Typically, essays require you to speak in the 3rd person. Rarely is it recommended that you use “I,” “me,” “my,” “we,” or “our” in a formal paper. However, the personal narrative is that rare exception: it is the time when you get to be you! The reason is simple: the essay is supposed to be about you! So embrace it! Let your inner you shine and tell a story about yourself. Personal narratives commonly serve as an occasion for you to reflect on some period in your life wherein you experienced growth, an epiphany, a problem that you overcame, or some phenomenon that left a deep impression on you. They don’t have to be heavy and overly serious, however. They can be as light and frolicsome as you’d like. There should be a beginning, a middle, and an end—just like in any story. And there should be some point to it. A personal narrative that goes nowhere might leave your reader feeling unfulfilled. Still, if you feel such a narrative would best reflect your sense of yourself and what you want to express, then don’t be shy: let it out the way you prefer. If you’re going to tell a story, you need to have a structure. The best kind of structure for a story is the simple beginning/middle/end structure. Introduce yourself to the reader using bold imagery. Move on to the story, and direct the action towards some climax or endpoint. That’s all there is to it! iii. Where are you going? b. Provide details to make the narrative feel vivid and alive. Now let’s see this outline get put to use, shall we? Once you have your topic in hand, all you need to do is start writing. An outline will help you stay focused, so be sure to sketch out a brief one before beginning. After you have that completed, just let the words flow. Be creative: this is your opportunity to let the inner you shine! Okay, so getting started really is one of the hardest things to do when writing. But with a personal narrative essay, it can be easy! What you want to focus on is finding the right hook. This means your essay should start off with a bang—a catch—a line or two that brings the reader into the essay. The hook should lead into the main idea of the essay. It should also, in some way, reflect the title of your essay. By reflecting on the title, you provide a quick, rapid-fire one-two combination on the reader. The reader will have no choice but to come along! The title, hook, and main idea should all cooperate: keep them aligned so that your writing is focused and concise. You do not want to be all over the place with your narrative—that is too distracting and indicates poor judgment on the writer’s part. Be critical of your writing: edit, refine, and retool so that it is the best it possibly can be. Once you have your introduction down, move on to main body of your essay and fill in the details that your intro should promise to deliver! You can choose almost anything when it comes to writing a personal narrative essay. Think about your life and what makes it special, fun, meaningful or interesting. Think about stories that you have told that made others laugh or cry or feel inspired. Mine these places for potential essay topics. Beliefs can be a great topic for a personal narrative essay: they allow you to explain how you arrived at them, what they mean, and how you manifest them in your life. Sports build character—and when you’re a kid they can teach you a lot of things. Whether you played baseball, football, soccer or tennis, describe your experiences in sports and what sort of things you learned. Birthdays let us know that we’re getting older. They also bring us together with friends and family. You give and receive presents, have a party and celebrate life. Tell about one particular birthday (yours or a loved one’s) that was particularly special. The holidays can be fun but they can also be stressful. Do you have any great holiday stories? If so, share! Nothing creates content for a great narrative like a journey to another country. Foreign places are new and exciting and offer their own unique challenges to visitors. Describe some of them and what they meant to you. A summer job is a time of growth, learning, and maturation. They can also be super fun. Combine these two perspectives into your essay. Friendships can be some of the most meaningful things in your life. They teach you to care for another person, to be there, to laugh, and to be supportive. There’s nothing like a flash of insight to give your life a new perspective entirely. Take an epiphany you once experienced and tell about how it shaped you. Dreams take us into new places and open us to things we might not necessarily otherwise consider. Do they have deeper meaning? Discuss! Humbling experiences are very meaningful and can be a great source of information for a personal narrative essay. Inspiration is another great topic. Tell a story about an event that inspired you to pursue a degree, apply for a job, do something special or move to a new place. Essays don’t have to always be upbeat: you can simply describe a story in which you were scared out of your mind. Build it up for the reader and provide a resolution so that your reader isn’t left on the edge of their seat! Sometimes we go through life without ever questioning our position or trying something new. Then all of a sudden we do something that seems so completely out of the blue that everyone around us is left scratching their heads. Can you describe such an experience? Describe a time when you made a decision or a commitment to a course of action that you had to follow through on. Tell how it made you feel, why you couldn’t back out, what it compelled you to do, how you came out in the end, and what you learned from it. Tell whether you were glad in the end or whether you still regret it! First off, I didn’t know I was becoming a Realtor till I signed on with a broker and “they” told me, “Of course you need to fork over more cash for another meaningless title that you will be told is very important and significant, etc., etc.” Already in a none-too-comfortable position but with credit card in hand, I allowed myself to be persuaded and handed said card over for another swipe. That is why I became a Realtor. But why did I become a real estate agent? (And, yes, there is a difference. Don’t ask me what it is, because when “they” were telling us the difference, my brain fogged over and I stared out the window and waited for them to stop talking). I tell myself now that I became a real estate agent for the simple reason that I wanted to buy a house and didn’t like having to depend on an agent to go look at them. They have their schedules; I have mine. They have their reasons—I typically eschew reason. I’d call up an agent or two and feel like I was waking a sleeping dog when I would ask to see a house pronto and would they please show it to me. At first, I thought they would love to do just that. When none of them communicated this love to me (after all, I had not taken the requisite steps of speaking with a lender, getting pre-qualified, or produced a letter from my bank indicating that I had sufficient funds to make a cash offer), I realized there was more to this business than I understood. I decided to know more about it, and thanks to several kicks from my wife I did not abandon this decision when class time began and I saw immediately what I was in for. We learned all sorts of things in real estate class—such as how to use math to figure out annual compounded interest of xyz, etc., etc., (though even still I am not sure what that means), metes and bounds, FHA, something about brokerages and licenses, and on and on. The man who ran the real estate academy from which I graduated was very nice and kind enough to put together a study guide for the real estate exams, one which I completed online and one which had to be taken at a physical location under the watchful eye of a proctor (because being a real estate agent is like delivering the mail—they won’t let just anyone do it—ahem—an aside I make in irony because I was once denied a position driving a mail truck as a result of a blighted driving record…). Miraculously, I passed both the federal (?—was it federal?—national?—I forget—it was all of 3 months ago…) and the state portions of the exam in the same sitting. The sun shone that day as I left the facility (or perhaps it was raining, as I said it was all of 3 months ago…) with certificate in hand, and off I went to go hang my license in a broker’s office. Hang, that is, after I finished applying for it and waited with nervous anticipation to see whether anything else from my past would come back to haunt me. Apparently not. One of the first things “they” asked when I finally settled on a broker was: “What made you want to get into real estate?” I had to pause and think about that. (I imagined they were trying to answer the question for themselves and were looking for some clue…as in—Is it possible that so many people could be duped by the local association of Realtors into thinking that real estate is an easy means towards financial wealth?). Indeed, in all the excitement of obtaining a license, I’d begun, in celebratory mood, to envision myself making hundreds of thousands of dollars as deals fell into my lap—because, hey, who doesn’t need a real estate agent? Eyeing them suspiciously, I did my best to not answer their question as I did not wish to expose the fact that I did indeed intend to make millions in real estate (lest someone else get the bright idea to do the same and elbow in on my market). Over the course of my initiation, however, I realized that pretty much everyone there had the same idea as I did—and there were many, many agents already in the field ahead of me. In fact, I determined that there was practically already a Realtor in every family. Sometimes two. I felt late to the party. But rather than humor my disappointment, I realized I ought to have another reason for wanting to be a Realtor. Surely competition was stiff—and I do not enjoy competition—so I needed new motivation. As I reflected over the course of my initiation, I found in the recesses of my mind that I simply liked the idea of being able to go look at houses for myself whenever I wanted. And for this privilege I was willing to fork over upwards of $200 a month—to the brokerage for allowing me the privilege of hanging my title in their window, and to the local association of Realtors…for…hm, I am still not sure what for. Nonetheless, I felt contented with this line of reasoning. Does it suffice still? Let me answer that question by providing the following observation. One thing I have noticed about the world of real estate is that it resembles a giant used car lot—except instead of clients coming to the lot to make a purchase, you the Realtor must find them and help them to see why they should make a purchase. In a market that is frothy (and likely to get frothier?—in truth, I do not even know what a “frothy market” means, but I am certain Google could tell us, so let us not worry about that…), assisting individuals in throwing money away is not something that makes me feel like a good person. (Are they throwing money away? Or is it only I who throws money away…?) Moreover, I have no interest in tracking down clients and pressuring them into sales that they might otherwise whole-heartedly regret/avoid. When a tidal wave of foreclosures finally tsunamis the planet, perhaps then I will be glad to assist people in the buying of a new (used) home. No doubt, they will wash up on my doorstep pleading for assistance. I am already licking my chops. Till then, I will sit and wait. And pay my E & O insurance. And my brokerage desk fees. Any my local association of Realtor fees. And my tech fees. And on and on. And, do you know?—I fully expect to be completely flat broke soon. Perhaps that is why I became a Realtor!—I wanted to know what it felt like to be poor. With that said, in time I hope to discover something about this industry and/or myself, and/or buy a house finally, hopefully with cash but more probably with the help of financing (and hopefully not one that requires me to get loan insurance—I hate all forms of insurance; speaking of which, my E & O needs to be renewed). Where did I put my credit card? It scores with a title that suggests a unique experience will be described in the paper. It starts off with a bang by landing a great “hook” in the first line. It uses self-deprecating humor to really let the personality of the writer shine and keep the reader amused. It stays on topic and doesn’t deviate from the main point of the narrative. It uses dialogue to help advance the action of the narrative and provides the reader with a sense of the narrator’s stream of thought. When it comes time to write your own narrative essay, you’ll need to find some topic that you can focus on and describe in detail. Hey, we know how hard it is to organize one’s thoughts and execute a plan. But we also do this professionally. Just like a teacher gets used to teaching lessons to students, our writers are used to providing clients with original model essays that are 100% tailored to meet the needs of students such as you. You can take our model essay, based on your parameters, and use it as a guide when you go to write your own narrative essay. In other words, you place an order, upload your instructions (the details or particulars of the narrative you’re tackling), and we write up a model paper that shows how we’d do it if we were in your shoes. We’re in the business of teaching by example—so order now—and let us give you a great custom written example of how you can turn your own experience into a stellar narrative essay. Writing a personal narrative essay is a great way to express yourself and communicate a meaningful experience to another person. You can adopt a comical tone or a serious tone—either or will work so long as you are being yourself. So remember, don’t sell yourself short: you are an interesting person. Even if it’s something as simple as sitting in your room, pouring over your own thoughts: there’s a story there—so let it out. When you write a personal narrative, you are the subject, the actor, and the director. You decide how everything should go. The audience is to receive what you hand on. Don’t imagine that you have nothing to give: it’s not true! You have everything to give, so get going! 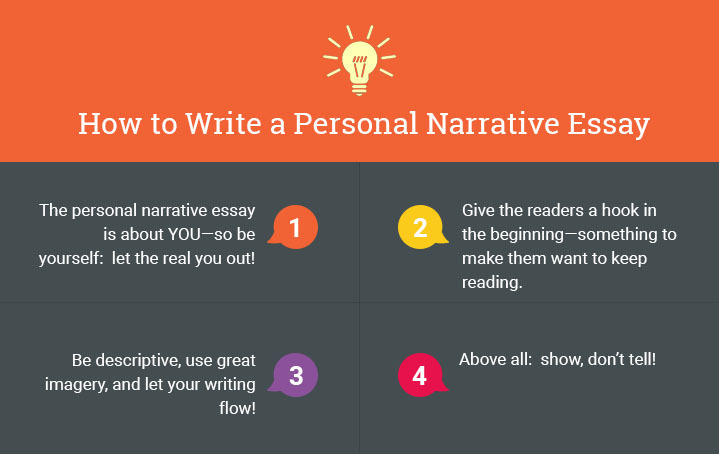 "How to Write a Personal Narrative Essay (Beginners Guide)." Aceyourpaper.com. Student Network Resources Inc, 14 September. 2017. Web. 20 April 2019. Student Network Resources Inc. "How to Write a Personal Narrative Essay (Beginners Guide)." Aceyourpaper.com. 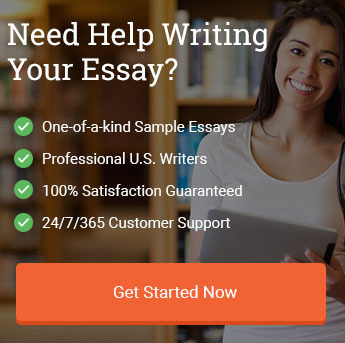 https://www.aceyourpaper.com/essay-writing/personal-narrative-essay/ (accessed April 20, 2019).